Does the month of October get you excited for all things haunted? Are you anxious to decorate with ghosts and goblins and spiders? Are you a huge fan of “The Walking Dead”? 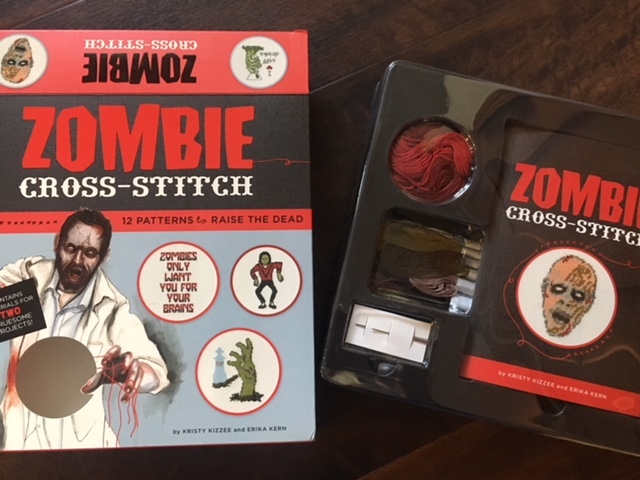 Then this Zombie Cross-Stitch kit might just be for you. Create your own Zombie artwork to hang in your office, on your door, or, gasp! put on your baby’s bib! 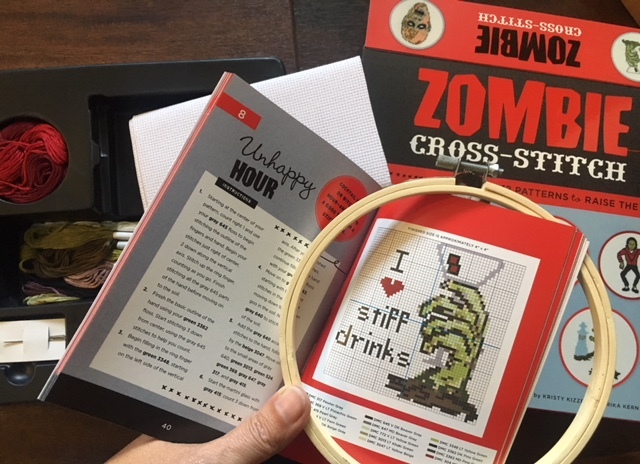 This Zombie Cross-Stitch kit has all the materials you need to complete two projects but includes patterns for a dozen. Even if you have never cross-stitched before the book covers basic techniques and gives the simplest of instructions for even the beginning cross-stitcher. Even though I am not a huge Zombie fan, I did find this design fun! I used to cross-stitch back in my single days over 20+ years ago and found it relaxing and fun to watch the design appear before my eyes. It was also a way I could give gifts to friends with a personal touch. Each kit comes with an instruction booklet, needles, floss, fabric, and an embroidery hoop. If you decide to make more than two of the designs, you can easily go to Michaels, Hobby Lobby, or JoAnn’s Fabrics to get more supplies. There are also plenty of YouTube videos out there to show you how to cross-stitch if you are a first-timer. ZOMBIE CROSS-STITCH is created by Erika Kern and illustrated by Kristy Kizzee. Thunder Bay Press published it on August 7, 2018. If this sounds like something you would like to try, you can click HERE to order your own kit or wait just a bit and enter to WIN your very own kit. I’m keeping this giveaway short so that I have time to send it to you before Halloween. Fill out the form below. This giveaway is made possible by Media Masters Publicity. I will do my best to make sure the kit arrives safely to its destination, but I am not responsible for lost items due to delivery. This giveaway is open to US only residents. One entry per person, please. This giveaway will end at 11:59 PM on October 8, 2018. I will choose the winner on October 9, 2018, and contact the winner via email. The winner will have 48 hours to respond before I choose another winner. THIS GIVEAWAY HAS ENDED. A WINNER HAS BEEN CHOSEN.